Rhubarb-Harvest done in a timely fashion will ensure a top rhubarb-season next year. When is it time for harvesting the rhubarb? If this is only the end of the first season, please wait if you can. Towards the end of the second season is much better, and the third year will be tremendous. The rhubarb plants require time and as much of their foliage as possible to establish a strong healthy root system. Picking can take place towards the end of the second season actually. So, be patient. When the time is right, the picking can start anytime in early June or even earlier for some people. It can last right through into the month of August. Long thick green rhubarb-petioles are just as good as the thinner red ones. The red stalks will be much sweeter. Medium stalks are generally very tender. Not to worry. They all provide good eating. When you are ready, simply reach down to the lowest part of the petiole and give it a good pull. I have never encountered any problems. The stalks seem to snap off from the crown fairly easily. Do not pick too much from any one plant at a time. Move on to another clump. Alternate what you pick over the course of the season. The longer each clump can hold on to the foliage, the better chance it has to keep producing. Just a reminder....if at any time over the course of the season you see a large stalk which looks like it is flowering as in the picture below, cut it off at the base. This helps to redirect all energy resources available back into the root system and strengthen them. 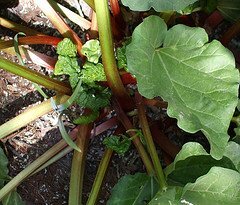 To complete your rhubarb-harvest cycle, you must cut off all of the leaves and throw them away. In all varieties of rhubarb, the green leaves are toxic. They contain a substance called oxalic acid crystals which could cause swelling of the tongue and throat. THE PETIOLES ONLY ARE EDIBLE BUT THE LEAVES ARE NEVER EVER TO BE INGESTED! The leaves can safely be thrown into your compost pile. The toxic acid has no effect on compost, so do not be concerned. While on this subject of how to harvest, it's good to note that you should wear gloves when handling the rhubarb at any time. You would not want children or animals near the leaves either. Better to be cautious!! If you would like to know more about composting or growing a vegetable garden, here is a great site I found and a "must" for beginner gardeners. Visit Garden Planting Tips and learn much more about making compost . 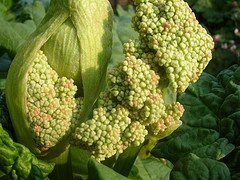 Just before you protect your rhubarb for the winter, now would be a good time for rhubarb propagation to have even more clumps for next year. This can be done in the Spring or the Fall, whichever time suits you best. It may be the end of the rhubarb-harvest, but rhubarb can be forced to grow during the off-season as well with an interesting technique.